Judging by our email at the Invisible Scar, folks have lots of questions about this site. So, we thought we’d take a moment to answer a few questions that keep coming up. No. The Invisible Scar is a blog with posts meant to help spread information about the prevention and awareness of emotional child abuse. This blog is meant to be a springboard for readers who’ve endured (or are enduring) emotional child abuse to realize that emotional abuse is not normal or acceptable and to seek professional help. This site focuses on both adults and children. We often address adults because most emotionally abused children will not actively seek help, so we reach out to parents to understand how to treat their children better or to adults who have suffered emotional abuse in their childhood. Why do you focus on narcissistic personality disorder? Though the Invisible Scar does have a subsection dedicated to this personality disorder, we do not think all emotional abusers have NPD. Though all people with NPD are emotional abusers, not all emotional abusers have NPD. In fact, some parents can change and learn how to better parent their children. However, folks with NPD never change. Also, very little is written about the adult children of parents with NPD, so we’re taking the opportunity to share what we’re learning about this personality disorder. The folks at the Invisible Scar have not shared their personal stories on the site for two main reasons: 1.) the website is geared to help people on their own journeys and seek professional help to guide them towards healing and 2.) the site is not a personal blog. Feel free to use the comments section to engage in a conversation about emotional child abuse. Comments are moderated, though, so any hateful language, abusive talk, spamming, or bashing, etc., will not be published. People cause emotional abuse, not religion. The Invisible Scar is run by Catholics, so we will mention the faith from time to time. You are not alone. 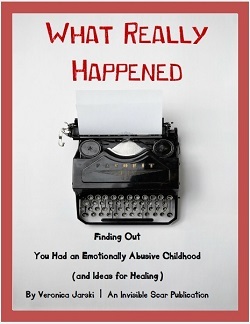 Myriad adult children of emotional child abuse have survived. They’ve unearthed the truth of their childhood, mourned what was, focused on the present, and moved forward to an emotionally healthier life. The path isn’t easy. The path can seem lonely. But you are not alone. We advocate that adult children do (legally, of course) what is best for their own healing. That always means a break from their parents, though whether the break should be permanent only the adult child can decide. We do believe that, in some situations, the adult children must go no contact with their parents if their parents have not shown remorse and a true change of behavior for an extended period of time. No one should be allowed to emotionally abuse another being, and no one should be forced to endure it. Why don’t you respond to every comment here? Though we read every comment on the Invisible Scar, we are often unable to answer every single comment. (We try!) Due to the deep emotional nature of the comments, we often just wish we could extend a hug to everyone and let folks know that we care deeply and pray for their healing. I’m exhausted from Yom Kippur, and this just came across my radar. The Invisible Scar is a blog dedicated to “Awareness and Prevention of Emotional Child Abuse.” They actually reach out more to adult survivors of emotional abuse and adult children of narcissistic parents. That is how I found them. I’m reblogging this as a resource for any of you who need it. Wow. I had no idea that there was a forum that addressed some the pain from my childhood. I am very eager to learn more about emotional abuse. I had a mother who was emotionally and verbally abusive and a father who was emotionally distant. My daughter who is an adult and living with me has some of the same tendencies for emotional and verbal abuse. I would like to know how to confront her in this so that she does not turn out to be a copy of my mother. I will read the book by Dr. Henry Cloud. I have most of his books already. 🙂 Thank you for sharing your wisdom regarding this evil. It is greatly appreciated. We’ve come across some fantastic personal blogs from adult survivors of an emotionally abusive childhood and would encourage reading a handful of them, so one does not feel alone. However, read too many and one can start to feel overwhelmed by them. The Invisible Scar is a little different in that the posts are mostly to inform and inspire people awakening to the truth of their childhood to get equipped with information about what to do next, know they are not alone, and get on the path to healing… Though the posts are not confessional-style or personal stories, we do care deeply for all who visit our pages and keep everyone in our thoughts and prayers for healing. Thanks so much. Dr. Cloud’s book Safe People was the book which put into words why I was so uncomfortable in my last relationship with a man. I knew my gut instinct told me to run but until I could identify in a literal sense why I had to run I couldn’t leave. Growing up with a narcisstic mother has caused me to have to redefine my boundaries continually. God love her she has been a real challenge for me to handle. Thanks again for your blog. I think that people really need to focus on loving their children as God loves us which is unconditionally. You’re very welcome, by the way. Thanks for taking the time to comment. God bless. I discovered this site and found that reading it was like reading about my own life. For years I have agonised over what I had done wrong and why my family treated me like I didn’t belong, I seriously thought maybe I was adopted or something. My mother always looks at me as if she wonders who I am. Anyway I have limited my contact with my family which has lessened the stress on me. And recently my mother said that she gets too upset talking to me on the phone and will now only write to me. She also said in her letter that she can’t manage making phone calls anymore. She of course has no problem phoning anyone else it’s just another of her games. I began writing a journal but wasn’t prepared for the strong emotions that surfaced while writing it. I will keep on because it does seem to help. I don’t want anyone else to read it though its just for me. I have always used my parents & family as what not to do with my own family and hope that I have succeeded. I wonder if anything can fill that empty spot that should be filled with a mothers love?